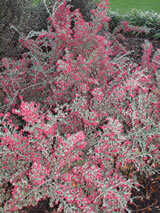 Bushy shrub with grey foliage and a rounded growing habit. 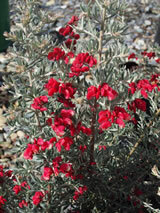 Bright pinkish-red flowers in winter and spring. Great nectar for the birds. Grows in dry conditions, prefers a sunny site. Hardy, avoid very heavy frost.